After months of uncertainty, the latest in two bestselling mystery video game series have finally come to the U.S… as one game. Yep. Capcom’s Phoenix Wright: Ace Attorney and Level-5’s Professor Layton have joined forces in a new game for the Nintendo 3DS. 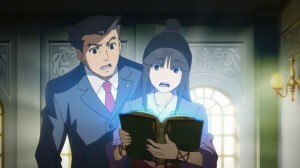 Well, sort of: since the game is called Professor Layton vs. Phoenix Wright, we can expect to see some kind of competition between them. I just haven’t played enough to see it. Familiarity with either series isn’t required to play Layton vs. Ace Attorney, as this is an entirely original story, but some basic knowledge of the characters might be in order. Phoenix Wright is a renowned defense attorney, working tirelessly to protect the innocent, condemn the guilty, and expose corruption wherever it may be found. Assisting him is cheery spirit medium Maya Fey, who can channel the spirit of her dead sister (Phoenix’s boss) to help him out when he’s in a pinch. Yes, really. He’s like Perry Mason but in an anime, like you haven’t already figured that out by the ridiculous hair and the teenage girl sidekick. Professor Layton, meanwhile, is a renowned gentleman detective who frequently finds himself sucked into bizarre supernatural mysteries that can only be solved by doing a lot of logic puzzles. He’s aided by his sidekick Luke Triton, an obnoxious boy with an even more obnoxious accent. Layton is apparently an archeology professor, but we’ve never seen him teach, so he’s like a British Indiana Jones with less action and more puzzles. The two series have a lot in common, so a crossover game didn’t seem that far-fetched when it was announced in 2010. 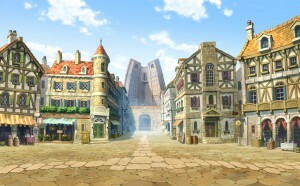 Fans of both series got excited– Phoenix Wright and Professor Layton solving a supernatural mystery in medieval times? That could go in some awesome directions. There was some concern that it would never be localized in the U.S., but we finally got it last week after a painful two-year wait. Well, I just got my hands on a copy, and I’m going to give you my first impressions, taken from the first few hours of gameplay. Note that I came into the game with a bias. 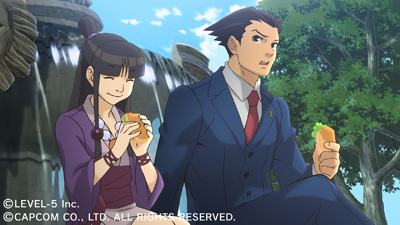 I’m a huge fan of the Ace Attorney series, and I adore Phoenix and Maya. Layton, though, I never got into (not a fan of puzzles). On the other hand, this game makes me want to take another look at it, since it does a very good job of presenting both series. 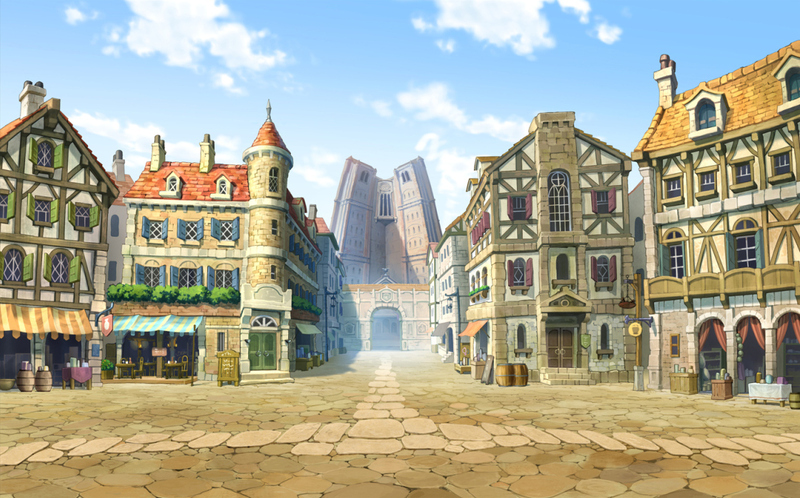 The story, as I’ve already implied, has both Phoenix and Layton transported to the medievalesque Labyrinthia, a town with no entrances, no exits, and a whole lot of mysteries to solve. All events in the town are controlled by the mysterious Storyteller, and his latest tale claims that witches will soon arrive to terrorize the populace. With witch hysteria rising to a fever pitch, a girl is accused of witchcraft, and it’s up to Phoenix and Layton to prove her innocent and solve the mysteries of Labyrinthia before everyone gets burned to death by an angry mob. Gameplay is split into two parts. 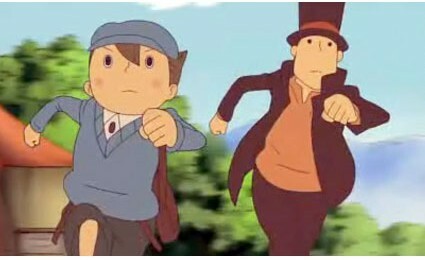 As Layton and Luke, you explore the town, investigate the people, and solve plenty of puzzles along the way. The interface is just like a Professor Layton game, with even the same audio/visual cues, which I thought was a nice touch. If you’ve played old adventure games, the point-and-click gameplay style should feel familiar to you. And if you get stuck on a puzzle, don’t worry– you can collect hint coins around town to help you out. As Phoenix and Maya, you take part in the Witches’ Court, battling against the Head Inquisitor for the fate of your client. 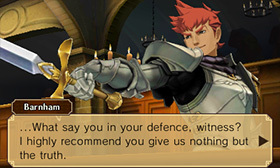 At this point the game plays like a regular Ace Attorney trial, where you press the witness for information and present evidence to contradict false testimony… with a few key differences. For one thing, instead of one witness at a time, you have many, and they’re all saying different things. They listen to each other’s testimonies and change their own based on what they hear, so you have to pay close attention to everyone. Also, there’s no modern forensic evidence, the prosecution is a literal sword-wielding knight, and if your client is found guilty they’ll be burned at the stake. So a little different from regular trials, then. Both series blend well in terms of gameplay, but I’m also impressed with the blended visuals. The Layton series has a distinct visual style, while Ace Attorney is more generic anime-y. The character designs here are a mix of both, and it looks surprisingly natural. (Phoenix and Maya do look very out of place, but they’re supposed to, being from modern times.) The use of 3D character models also adds a greater range of movement and expression, though I admit I prefer the traditional hand-drawn art used in earlier games. The music, as you would expect, consists of remixes from both games, but oh, what glorious remixes they are. Take a listen. That’s the main themes from both games blended together, and it sounds amazing. There’s a lot of voice acting here, which I’m not used to in Ace Attorney, but it’s all well-acted. 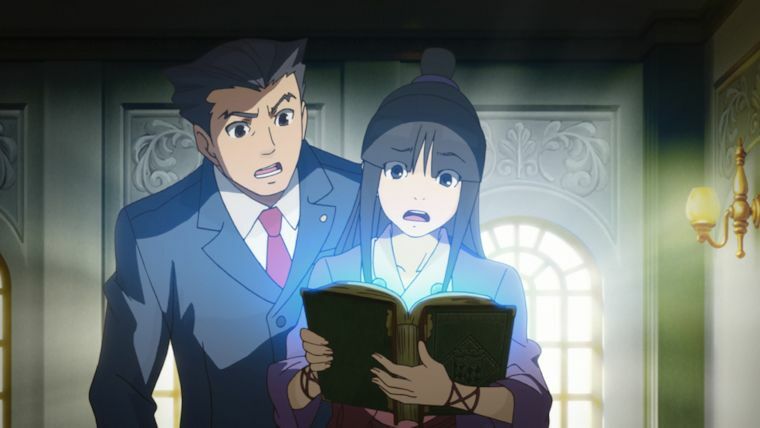 The only voice I have a problem with is Maya Fey’s– the actress’s performance is fine, but it’s just not, well, Maya. Not a major issue, but I love Maya, so it does bug me a little. She should sound like a hyper teenage girl, not a slightly-perkier-than-average woman. A couple final thoughts before I go back to playing. I’m really enjoying myself with this game, which for me is enough to give it a recommendation. Without spoiling much, it takes some very unexpected turns. I’m excited that it managed to surprise me and get me invested in the story. My only hope is that it doesn’t start treading on familiar ground for this kind of premise, ’cause I am so, so sick of Neverending Story-style plots. 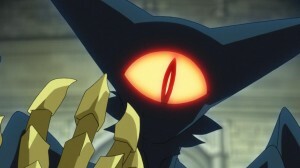 Since both series love to go off into the ridiculous, I have faith that it won’t. Fans of both series should already own this game. Fans of one should check it out– you might wind up getting interested in the other. If you really hate either Ace Attorney or Professor Layton, this may not be the game for you, as it has equal parts of both. New to both? This could be your introduction into some of the greatest handheld games of this generation. Professor Layton vs. Phoenix Wright: Ace Attorney is available for the Nintendo 3DS family in both physical and digital form. Pick up a copy and enjoy the ride!